The short version of my heartbreak is: I got engaged, left my job for a freelance career, and moved abroad to be with my fiance. Months later, we broke it off, and then, of course, I flew back home to the Philippines and spent some time in Siargao. I moved back to my old bedroom, continued working from a laptop, and kept asking myself the same question over and over again: What do I do now? I needed to get away, and I thought of Siargao. Siargao has always been an elusive dream destination to me. When I started learning how to surf in Baler and La Union, I wanted to be a good enough surfer to actually frolic in the "Surfing Capital of the Philippines." I would quit my desk job, move to this paradise, and then perhaps live happily ever after. This was something I only dreamed of, but a friend of mine actually made it her reality. 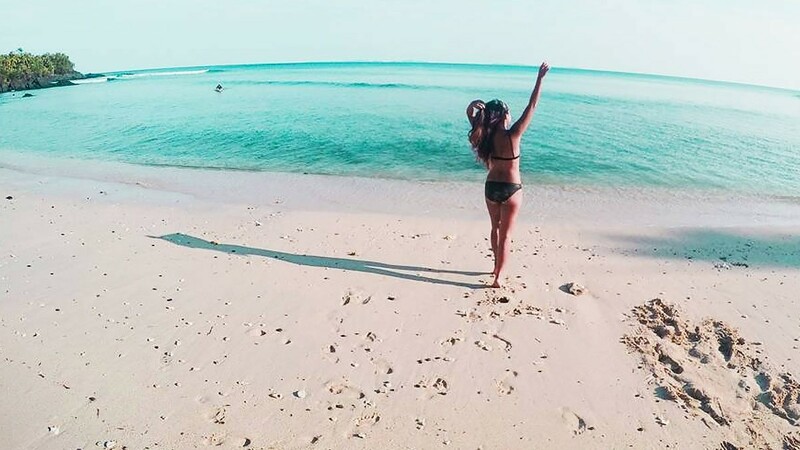 Every time I saw her sun-kissed glow on my Facebook feed, Siargao pulled me a little closer. I wanted that for myself, too. So I did it. I booked a flight to Siargao, a one-week trip with no itinerary. My plan was just to wing it, to live in the island and see if I could actually pursue my "island girl" dream. I stayed at The Smiling Pig Hostel, right in the middle of General Luna, a vibrant but laid-back surf town where all the action is. The hostel is a major part of my story, because this is where my Siargao story begins and ends. I arrived just a little after 1 p.m. on a weekday—backpack in tow, in my mom jeans and airport hoodie. I soon realized I was overdressed for the island because I was greeted by the Zumba-dancing hostel staff, clad in only their bikini tops and shorts. One of the managers, a petite Filipina named Mona, asked me without missing a single step, "Do you want to join us?" Join their Zumba session? In my hoodie and jeans? Now? "Okay," I agreed. I joined their little formation and jammed to "Buttons" by The Pussycat Dolls. After the song ended, I was assisted to my dorm room, where I shared a bunk with a Russian girl who was indefinitely living in Siargao. In fact, as I write this, she is still having the time of her life in paradise. The room had a couple of bunk beds, standard fans, mosquito nets, and a view of a palm tree from our small window. It was my home for the following week. Not too long after, I joined a group of solo travelers in the hostel veranda—a people-watching spot that I would later come to love. "Hey guys, I'm Ayn," I introduced myself. We talked, laughed, and shared travel stories. And then one by one, they retreated to their respective rooms, exhausted by their morning surf session. Before I was finally left alone in my new favorite spot, the hostel owner gave me a tight squeeze and said, "Welcome home." And I really was home. The following day, we all drove to a surf spot that was over an hour away from General Luna. I didn't know how to drive a motorbike, and so I took the backseat of one of my new friends' scooters. I ended up not having to rent my own for the rest of the trip because someone was always happy to give me a ride. I was only there for a week, after all. That same day, I burned my ankle on the motorbike exhaust pipe. That led to an infection, and then eventually the cancellation of all of my planned surfing shenanigans. No big deal, I thought. I was already convinced that I'd come back to Siargao no matter what. The following days were pretty much the same, though still special. In the mornings, the group headed out to surf, came home, took a nap, and then at night, we bought drinks and played games, or headed out to a bar in the area. We met other travelers and danced to our hearts' content. Some mornings, we grabbed hangover burgers and fries at the 24-hour restaurant next door. On my second to the last day, our group took a boat to a secluded beach, where we stayed overnight to celebrate our friend's birthday. Almost ten surfboards were tied to our bangka, while buckets of fresh fish sat in the middle. We had a guitar, a couple of tents, a hammock, a jug of drinking water, and a mosquito net. We weren't exactly prepared for a camping trip to a beach with no mobile service or electricity. But what could go wrong? The boatmen left and promised to come back for us the next morning. After their quick surf session, we all hiked up the hill to catch the sunset. I remember this moment distinctly, because this was the moment tears rolled down my face. I was already standing at this point, staring at the sunset, emotional over the beauty that was before me. I couldn't believe I wasted so much time being heartbroken and lonely when this miracle was happening every day… right here. That night, we had a bonfire, floated by the shore, and watched the stars. We danced around our only source of light, and we chased fireflies. We got rained on, too! I spent the rest of night on a shared hammock, with a rain jacket shielding my face. After we got back, we went back to our usual routine and after a much-needed nap, we spent the night partying. Everyone was gathered that morning for breakfast, lounging in their usual spots. I'd only been there a week, but this was already what normal looked like to me. Heavily, I said my final goodbyes, gave my last hugs, and walked out that tiny gate with a promise in my heart. I’ll be back, Siargao. Thank you for curing me.